For the foreshock that occurred a week before, see July 2018 Lombok earthquake. On 5 August 2018, a major earthquake measuring Mw 6.9 (7.0 on Richter scale) struck the island of Lombok, Indonesia. It was the main shock following its foreshock, a nearby 6.4 earthquake on 29 July. The epicentre was located inland, near Loloan Village in North Lombok Regency. The earthquake caused tsunamis across the coastal region of the city. 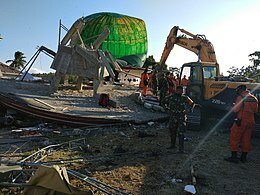 In the aftermath of the earthquake 259 people were confirmed killed while more than 1,400 were confirmed injured. More than 165,000 people were displaced. ↑ "BMKG: Tsunami 10–15 Cm Sudah Masuk Daratan Lombok". IDN Times. ↑ "Lombok earthquake: Number killed on Indonesia tourist island rises to 319". Sky News. Retrieved 9 August 2018. This page was last changed on 18 April 2019, at 14:23.